Reading this before March 4, 2018? Be sure to enter our KORXX giveaway on Facebook! But the blocks bounce harmlessly off her, barely audible as they hit the ground. No cacophony. No injury. Just another lesson learned — not to mention more space for the next project! Jenna’s shrieks turn to delighted laughter, and she starts gathering the fallen cork blocks for her next record-breaker. Introducing the KORXX Collection from ECR4Kids! 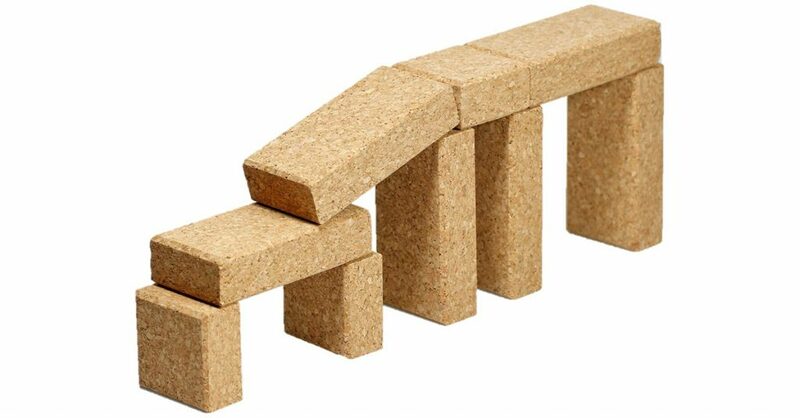 These lightweight cork building blocks are eco-friendly, safe to stack to towering heights, quiet when they tumble down, and an absolute blast to play with. Fun with Friction — cork is lightweight and has a naturally grippy texture, making it possible to create fantastic structures using friction as a tool! Take a peek at the video below to see a demonstration of this amazing characteristic. Lightweight & Quiet — traditional hardwood blocks clack and thud as kids’ castles, towers and other contraptions come tumbling down. Cork is light and naturally absorbs shock, making it a quiet play option that parents will love. Because they’re naturally lightweight and have rounded edges, KORXX blocks pose fewer risks during playtime — you can stack them overhead without worrying them tumbling down on your head! Amazingly Aquatic — cork is very buoyant in water, unlocking a bounty of new ways to play! Try taking them to the pool or the beach and watch the blocks bob to the water’s surface time after time. They can even make a fun new addition to bath time! Eco-Friendly — cork is a 100% sustainable material, making KORXX blocks a conscientious and eco-friendly play option. We want children to have the best possible toys, but not at the cost of the planet they’ll come to inherit! S.T.E.A.M. Approved — building and experimenting with blocks is a valuable part of science, technology, engineering, art and math education. The unique properties of KORXX blocks will have kids pushing the limits of their imagination as they create structures that seem to defy gravity! Read on to learn about all the fun variations of KORXX! Or, you can use this link to our site to explore the entire collection at once. Eco-Blox are the classic unit of KORXX. Modeled after traditional hardwood blocks, Eco-Blox sets are composed of basic squares and rectangles that are perfect for building everything from castles to pyramids! Big Eco-Blox for larger-than-life projects! Big cubes and rectangles are perfect for building substantial structures. Even though they’re heftier than other KORXX blocks, they’re still relatively lightweight and capable of creating gravity-defying buildings. A variety of shapes unlocks more ways to stack, build and baffle! With rounds, cylinders and triangles added to the mix, this assortment of shapes will challenge lil’ builders to take their creativity to new heights. Eco-Brix Minis are the perfect way to pass time when traveling! Whether taken in the car, on a hike or just in the bath, these bite-sized blocks still boast all the fantastic features of cork. Eco-Rounds are a true demonstration of the power of cork! Hardwood circles and ovals aren’t suitable for building, but the gravity-defying properties of cork make Eco-Rounds as captivating as any KORXX set! Founded in 2003, ECR4Kids is dedicated to creating high-quality children's products that are functional, durable, and fun! With selections ranging from home and classroom furniture to educational toys and art supplies, ECR4Kids is your resource for innovative learning experiences for kids in Pre-K and beyond. Interested in keeping up with ECR4Kids? Sign-up to receive updates on giveaways, new products, and other ECR4Kids news!